Abba P. Lerner was a Russian-born American professor of economics. Educated at the London School of Economics he taught successively at Roosevelt, Michigan State and from 1965, California Universities His early work centred on the nature of monopoly. In his 1933 Review of Economic Studies article The Concept of Monopoly Power, Lerner introduced a quantitative measurement of the degree of monopoly. 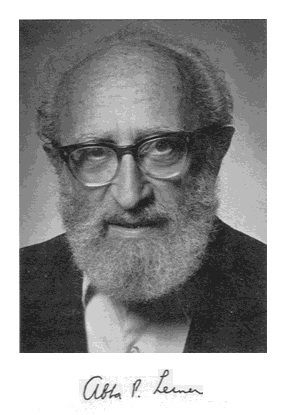 His later work is mainly in the field of welfare economics as in The Economics of Control (1944)..